AXE, the no. 1 fragrance brand in the world, unveiled a campaign in January 2013 to take the first Filipino to space with over 20 others from over 160 countries worldwide to celebrate the launch of AXE Apollo, its newest and possibly most iconic fragrance yet. It was iconic and unique that many got interested to try out a competition that will give a chance to a select few to be sent to space and become astronauts. The Philippines was among the top countries that participated in the global campaign with over 28,000 applications for the opportunity to become the first Filipino to ever go to space. Many were called in to take on various challenges to test their mind, body and spirit. Participants were slowly eliminated in each round. From thousands, 3 candidates were selected to represent the country at the international AXE Apollo Space Camp held at the Kennedy Space Center in the U.S. The three candidates underwent astronaut training with over 100 others from all over the globe. Finally, one Filipino has been chosen to take to space by 2015 as the first Filipino astronaut. After 5 days of grueling tests and challenges at the AXE Apollo Space Academy Space Camp in the US, 22-year old Crossfit trainer and De La Salle University psychology graduate Daniel Angelo "Chino" Roque was declared the first Filipino astronaut by the legendary Apollo 11 astronaut Buzz Aldrin. The ceremonies were held at the Kennedy Space Center Rocket Garden. “At the awarding ceremonies, when they called my name, all I could think about is how fortunate I am. From the start, this had been the experience of a lifetime. I’m grateful to the team of admirable guys I went to Space Camp with – Ramil and Evan – as well as the support of family, friends, and my countrymen,” shared Roque. Roque is set to become the first Filipino astronaut to be sent to space in 2015, joining 23 other AXE Apollo Space Academy winners on a sub-orbital space flight. The three Filipino representatives – Evan Rey Datuin, Ramil Santos, and Chino Roque – underwent training at the AXE Apollo Space Academy in Orlando, Florida. They experienced Zero-gravity Parabolic Flights on board a Boeing 727, Air Combat Training on-board an SIAI Marchetti SF260, and Hyper-gravity G Force Training. The entire Filipino delegation, especially Roque, impressed the AXE and Space Expedition Corporation (SXC) judges with their performance on the challenges. Roque was one of the few who were able to maneuver the plane. All three delegates pushed their bodies to the limit as they took on the incredible pressures of hyper-gravity at four times the force of Earth’s gravity. AXE Apollo’s Space Camp officially ended with the graduation of all 107 delegates and the awarding of the 24 space flight winners. 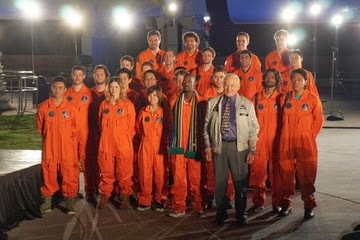 The graduation ceremony was led by Apollo 11 astronaut Buzz Aldrin, the chairman of the judging committee. Other members of AXE’s judging committee were XCOR Aerospace COO Andrew Nelson, whose rocket engine company is manufacturing the space craft that will fly the 24 winners to space; Space Expedition Corporation (SXC) CEO Michiel Mol; SXC Test Pilot Mission Control COO Harry Van Hulten; and SXC Director of Commercial Space Marlous Mens. “AXE Philippines, as I am sure the Filipino people as well, are proud to have had Chino, Evan, and Ramil represent our country at the international AXE Apollo Space Camp. They showed that Filipinos are courageous, determined, and resilient,” says AXE Brand Manager Gem Laforteza. “AXE Apollo is about heroes. It’s about setting out to do what seems impossible,” says AXE Apollo Philippines judge Luis Manzano. “We would like to believe that AXE’s campaign has inspired Filipinos and people everywhere to imagine the unimaginable,” says Laforteza. Since its launch, AXE has received more than 1 million AXE Apollo Space Academy entries globally with the Philippines ranking 4th in the world and 1st in Asia in terms of applications. The space flights are set in 2015.